Austin Ruddle of McDonald’s takes a swing in a boys coaches pitch game at Mitchell Park in Greenfield. Leland Ewry gets a hit in boys coaches pitch action last Wednesday at Mitchell Park in Greenfield. Lexi Burns of Pizza Hut takes her turn at the plate in a girls T-ball game at Mitchell Park in Greenfield. Kohri Toney throws to first base in girls T-ball action at Mitchell Park in Greenfield. 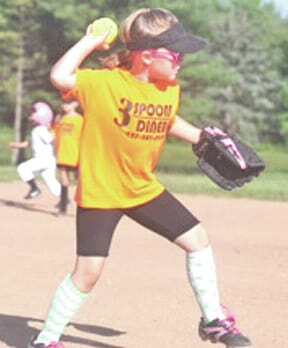 Makayla Murdock of 3 Spoons Diner is shown during a girls T-ball game at Mitchell Park in Greenfield.